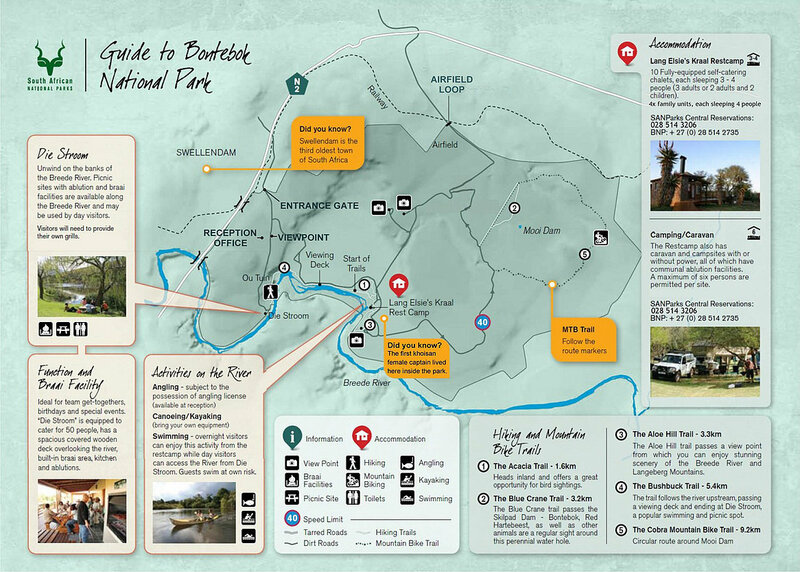 Bontebok National Park is on the banks of the Breede River, just 5km from Swellendam. When the Bontebok species was approaching extinction in the early 1800s (approximately 17 Bontebok left) some land owners set aside portions of their properties to form temporary reserves for the Bontebok. Mr. P. V. van der Byl, his son, Mr. A. van der Byl, and the van Breda and Albertyn families recognised the perilous situation of the species – without these families’ efforts the Bontebok might well have become extinct. Today your chances of seeing Bontebok, Blesbok or Zebra are very good.